Have a question on Peugeot 208? Peugeot 208 is available in 8 different colors - Pearl White, Ruby Red, Twilight Blue, Shark Grey, Aluminium Grey, Bianca White, Orange Power and Nero Black. Watch latest video reviews of Peugeot 208 to know about its interiors, exteriors, performance, mileage and more. Peugeot 208 is a supermini car with 5-doors and 4-seats configuration. This hatchback was first introduced in the year 2011 with a 3-door and 4-seats configuration and was later launched with the existing layout as well. This B-segment vehicle has got decent features and engine which make it a darling among small families looking for an affordable car. Since the styling of this car is inspired bu PSA PF1 platform, the weight of the frame is reduced which makes it more fuel efficient and eco friendly. In UAE, Peugeot 208 is available in 3 equally desirable variants namely Active, Active Plus and Allure. Step inside the Peugeot 208 hatch and you will be awe-inspired by the contemporary styled cabin. Well, this contemporary interior doesn't mean that you have a boring interior, rather its modern facilities and advanced technology is going to refresh you after every drive. Sporty looking dual colored seats are placed which give an elegant touch to the interior. That Peugeot Lion on the centre of the steering wheel makes it look better. The sorted and well organized dashboard not only makes the front fascia look good but also make it convenient for the driver to handle the controls. With all this, you also get cruise control which allows you to sail your beautiful hatch on the smooth surface of highways. This hatchback has got decent space for all its 4 passengers and also for their luggage. With 270 litres of boot space and 60:40 split fold of rear seats, you can rest assure that all your luggage is accommodated properly in this hatch's boot. Comfort and convenience is not everything which you get in this Peugeot hatch. You get infotainment facility also to satisfy your music craving between the drives. USB, Bluetooth and Aux connectivity along with a 7-inch touchscreen is there in this Peugeot 208 for navigation and entertainment of the occupants. The exterior of this elegant hatchback is given a stylish yet sophisticated look. It has a beautifully crafted glossy black front grille with Peugeot Lion on the bonnet. The front lamps looks like merging with the upper front grille making it wide and more elegant. The external side mirrors have LED turn indicators for the convenience of the rear vehicles. The crisp bodylines on bonnet and side profile give this hatch a classy look. A panoramic sunroof is also provided which adds grace to the aesthetics of this hatch. The overall dimensions carried by this Peugeot vehicle are 3962 mm x 1739 mm x 1471 mm (L x W x H) along with a wheelbase measuring 2540 mm. The car has been employed with suavely designed 16-inch alloy wheels which further adds to the dynamism of the car. Peugeot 208 is available in 3 enticing trim levels in the country and carries some interesting features to deliver a comfortable ride. The sole 1.6-litre 4 cylinder VVT engine is mounted beneath the elegant bonnet of Peugeot 208 which knocks out a maximum power output counting to 120 bhp at 6000 rpm along with a maximum torque of 160 Nm at 4250 rpm. This engine is mated with 4-speed auto Tiptronic transmission which accelerates from halt to 100 km/hr in mere 8.0 seconds clocking a top speed of 180 km/hr. Talking about its fuel efficiency, this engine gives a decent mileage of 5.8 l/100km and proves to be economical. 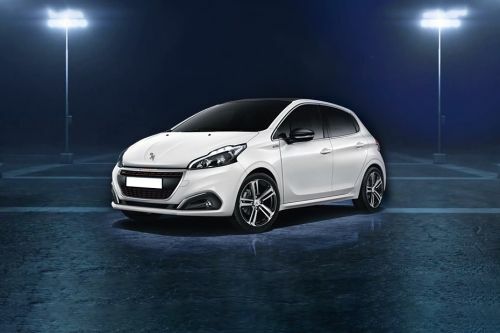 Peugeot has ensured that every drive in its 208 hatchback is safe and secure for its passengers. This hatch is equipped with several active and passive safety features which safeguard the occupants in an event of collision. This frame of this Peugeot product is made from high-tensile material which absorbs the impact. You can find airbags for front seat passengers and seat belts for all the 4 occupants in this hatch. Also, there are Anti-Lock Braking System and Electronic Stability Program for a stable and safe drive. With its front fog lamps you can have a safe drive even during foggy weather. Overall, the EuroNCap safety features of this hatchback make it a very safe vehicle for you and your loved ones. An effective McPherson strut front and torsion beam rear suspension system is employed so that you enjoy a comfortable ride in this Peugeot product. Peugeot 208, with its advanced safety and comfort features at its exterior and interior, is good enough to create a fan club of its own. However, this hatchback is available with a single petrol engine which is a disappointment. What is the price of Peugeot 208? On road prices of Peugeot 208 1.6L GT Line in is costs at AED70,000 . What are the colors options available in Peugeot 208?